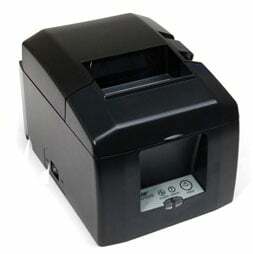 Star TSP650 Series: TSP650ii BTi - Thermal, Auto-cutter, Bluetooth Interface. Includes Power supply. Color: Dark gray. Works with Apple iOS (iPad, iPhone, iPod), Android, and Windows. Also known as TSP654IIBI-24 GRY US. Apple MFi certified, the TSP650II BTi receipt printer is approved for use with the Apple iPod Touch, iPhone and iPad. With operating system support for iOS, Android and Windows, the TSP650II BTi features the best of both worlds by coupling the comfort of legacy products with the speed and connection options demanded today in fast-paced point of sales environments. The TSP650II BTi's "JustWorks" SSP profile makes the pairing process very simple to use. It allows for a quick connection without the hassle of a passkey or having to choose between iOS and Android modes. Quick and ready to use, no user interaction is needed to pair the TSP650II BTi. One attribute that grabs the user"s attention is TSP650II BTi's lightening fast print speed. Capable of printing 60 receipts per minute (300 mm/sec), the TSP650II BTi offers unrivalled processing power and outstanding data throughput. Equipped with easy "drop in and print" paper loading, small footprint and reliable guillotine cutter, the TSP650II BTi is a welcomed addition to any POS system. With exceptional performance, functionality, Bluetooth accessibility and iOS support, the TSP650II BTi embodies Star's motto of "Always Leading- Always Innovating." We use these in a medium sized school cafeteria. They hooked up easily and work well for our needs. The Star 39449870 is also known as Star Micronics	STA-TSP654IIBI-24GRY	.